Kisumu County Government announced on Thursday August 9th that it's preparing a massive registration drive to roll out universal health coverage (UHC) for all its residents. To help reach this important and ambitious aim PharmAccess has been asked to assist the country’s National Hospital Insurance Fund (NHIF) to achieve UHC by 2022. Public-Private partnerships - a game changer for the Nigerian health sector? As part of the Kenyan’s government’s push towards achieving universal health coverage (UHC) over the next 5 years, all Kisumu county residents will gain access to the National Hospital Insurance Fund (NHIF) for comprehensive health services. Kisumu is one of the four pilot counties for the UHC pilot and has developed an innovative healthcare model that combines access to health insurance with better quality of care. Utilizing a public-private approach, the county has partnered with PharmAccess for technical assistance. The partnership will facilitate digital registrations into NHIF, health financing, and service delivery in a cost effective and transparent way. The work will utilize the M-TIBA mobile health platform, enabling a registration application to be developed and tested in the field. While an additional poverty mapping tool developed in conjunction with Amsterdam Institute for International Development rounded off the suite of technological partnership and solutions making possible the registration drive. 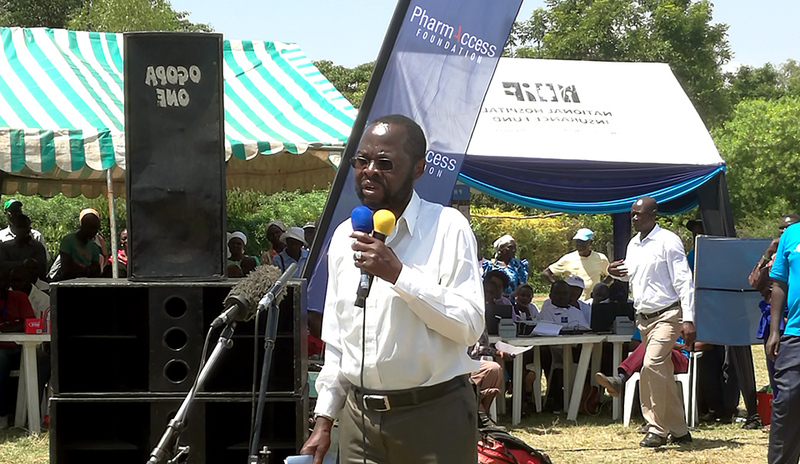 PharmAccess will engage community health workers to register residents in door-to-door visits and special registration desks at convenient locations. Each community health worker will utilize smart-phones with M-TIBA. This allows the collection of socio-economic data and NHIF registration in real-time as M-TIBA is linked to the NHIF system allowing the immediate issuing of registration numbers. Preparations are currently underway with the two counties to start implementation as soon as possible.